Day 2 of Lain Ehmann's CreativeLive workshop! If you have time today between 9:00 am and 4:00 pm Pacific, hop on over and watch! I promise to tell you ALL about it and share what I made once I carve out a block of time to scan and upload. Realistically, that translates into "not until next week." In the meantime, I'll be showing you some of the creative things I've been doing this month now that I'm done sharing layouts from National Scrapbook Day. 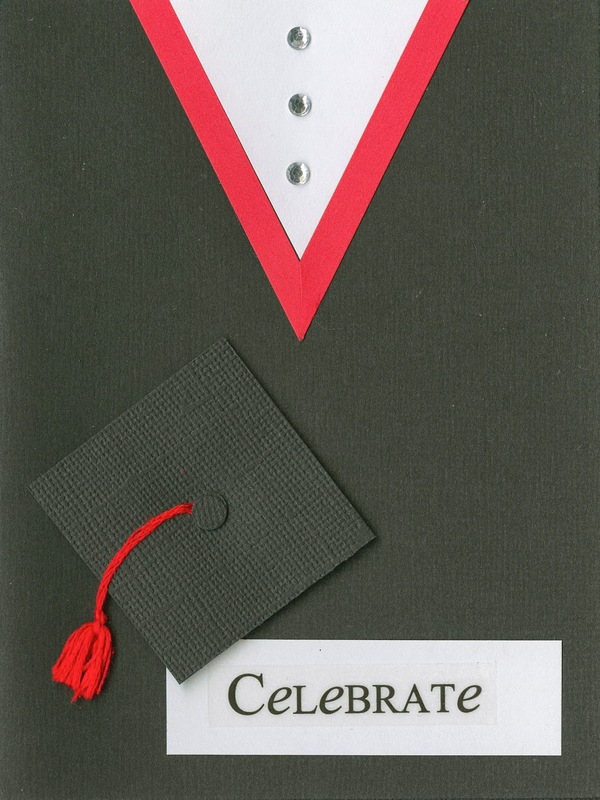 Here is the card I made for our nephew, Ian, who graduated from CSU Chico last weekend. I did a quick search to learn their school colors (cardinal and white) before adding the sash and tassel. My inspiration was this card by Katherine Pritchard. I really like the simple design. I think this will be my new go-to graduation card. I love how easy it is to customize it with school colors. Speaking of school, Trevor's teacher asked me if I would be in charge of our class basket for the silent auction at the school carnival. Of course I said yes. I chose an arts & crafts theme (naturally) and collected items and/or cash donations from the students. I recruited a fellow parent, Annie, to join me for a shopping spree. (I've learned that, when handling other people's money, it is always a good idea to have a second adult present.) We had great fun zipping through Michaels throwing things into the cart! That was the easy part. Squeezing all the goodies into the basket in an attractive manner was much, much harder! There's a lot of hidden tape keeping everything in place. Here's what the basket looked like when Annie and I were done. That's $140 worth of craft supplies stuffed in there! Whoever wins it is going to be in craft heaven. I hope it brings in a lot of money for the school. Love love love the card!! That hat is fabulous!!! And loving the basket ... hope it brings lots of $$$$$$$$$$!!!!!!!! Love the card and that auction basket looks awesome!